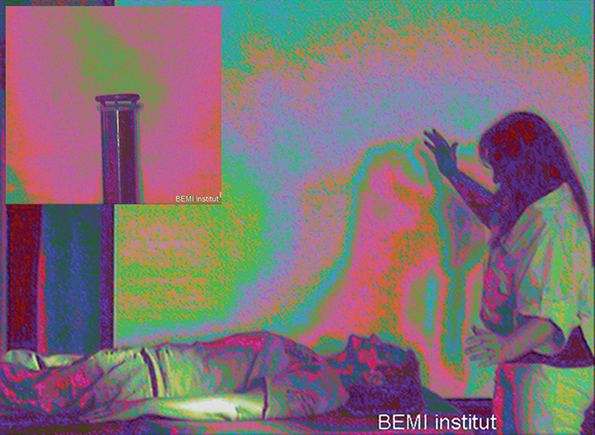 The purple colour in the PIP camera images of Tesla Metamorphosis® sessions is identical to the purple colour around the Tesla Amplifier with Extra Coil (left corner) which radiates Tesla Waves. Tesla Metamorphosis® has the privilege to have Tesla’s name in the name of modality because we can access Tesla Waves. Tesla Waves are, according to scientists, unique for this form of healing. They are accessed directly from Active Ether, there are no machines involved. Unlike in the spectrum of the Hertzian domain, the density and the frequency of Tesla Waves are inversely proportional to the square of the distance. Tesla called them “non-hertzian waves”, and he wrote that they are different, not just in frequency, but also in their structure and form; they are multidimensional, and they are in the domain of a new physics. The difference among healing modalities is not in how we lay or move our hands. The difference is in which frequencies and densities of energy, information and light can be accessed, to get in communication and interact with. According to the images made by PIP camera during sessions, what is new in Tesla Metamorphosis, is that we can access Tesla Waves, or Tesla’s bio-field, in addition to some other frequencies and densities of energy. Many will ask – who is Tesla? Nikola Tesla is the man who invented the future. If we only mention alternating current, radio, wireless transmission of energy and information, remote control, robotics, lighting and AC induction motors, out of more than 700 of his patented inventions, it is obvious that without him, technology would not be where it is today. So, why was this man erased from history? Because he discovered the way we could use free energy, and it was not possible to put a meter on and charge for it. Tesla Healing Metamorphosis® attracts great interest because clients report healings from many diseases that are considered incurable, such as cancer, AIDS, lupus, chronic fatigue syndrome, even healings from physically damaged spine and birth deformities. Also, healings happen very quickly. Most of the time, three sessions are enough. Every living cell radiates light. Light is life. Tesla used the term “the spark of life”. Young and healthy cell radiates vibrant, coherent light. In old and sick cell this light is weak and chaotic. Tesla Metamorphosis creates a complex metamorphosis of the human body through bringing it into the perfect balance of light.Biophotons, these light particles, traveling at the speed of light, make up the electromagnetic frequency patterns. This matrix, or field of frequency oscillations or resonance [Tesla’s biofield] specificity provides the energetic switchboarding behind every cellular function. It provides DNA/RNA messengering and conducts the transference of information among cells, and throughout the Universe. Nikola Tesla was aware that energy is not just a mechanical movement of particles; that he was interacting with Consciousness. Nowadays they call it the Field. Tesla used to call it Active Ether. In Tesla Metamorphosis, we are in this Consciousness through our heart intelligence. The healing occurs through thetransfer of information between the consciousness of the client’s bodies and Active Ether (the Consciousness). The healer is invited to be a part of the equation – observer and the observed.